By The Time Your Car Goes Driverless, You Won't Know The Difference : All Tech Considered The once-futuristic concept is closer than ever to becoming a reality. Parallel parking? Let the car find the perfect approach. Squeezing into a tight space? Hop out and use your smartphone. 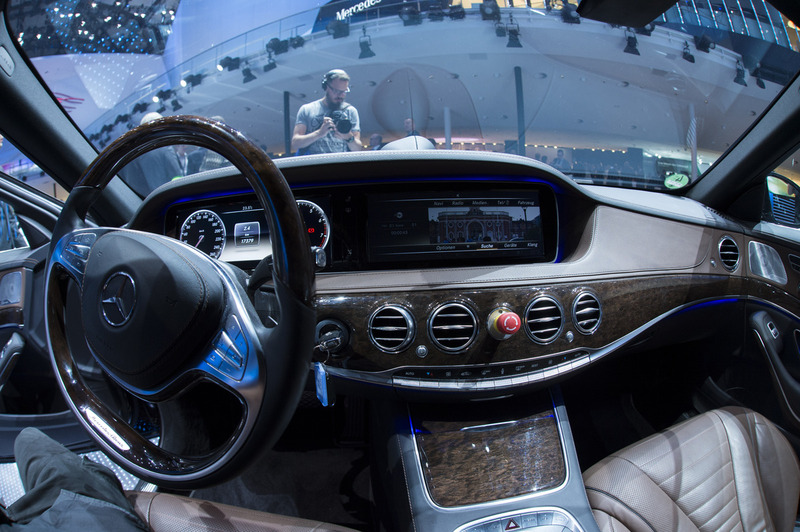 Mercedes' S500 Intelligent Drive is one traditional carmaker's approach to driverless cars. Not to be outdone by a tech company, the traditional carmakers have major development programs, too. The Mercedes S500 Intelligent Drive concept vehicle recently drove 100 kilometers between German cities. Nissan has promised some kind of autonomous vehicle by 2020. GM's EN-V concept car is a funny little electric pod that would detect pedestrians in a crosswalk and automatically slow the vehicle. (It could also communicate with smart infrastructure and traffic optimization apps to, say, detect that a drawbridge is up and plot a route around it.) And Ford imagines packs of vehicles sensing their surroundings with stubby, horn-like antennae and communicating about traffic conditions amongst themselves. There are a lot of steps, however, between Henry Ford's Model T and Google's autonomous Model X. Carmakers need to figure out how to make vehicle-to-vehicle communication work, prove the safety and reliability of new technologies, and make them cheaper. Google's cars use tens of thousands of dollars' worth of sensors. They also require a level of trust in the onboard computer that I, at least, find it difficult to muster. And let's not forget the problems of insuring a vehicle without a driver. Most of us, then, are going to encounter autonomous driving in little autopilot moments when we cede temporary control to a computer. In the near future, cars will take over for us in those special driving situations that teenagers practice for their drivers' tests. Parallel parking? Let the car find the perfect angle of approach. Squeezing into a tight space? Hop out and press a button on your smartphone. Nissan's new vehicles already detect when you have mis-steered into a turn and silently guides the wheels along a better trajectory. In the Volkswagen Passat, a technology detects the lane markings on the road with a front-mounted camera and gently "countersteers" if you begin to wander from your lane. Where Volkswagen is pushing the furthest, though, is in its Audi luxury car line. Some models already have an advanced cruise control that uses a long-range radar system to detect other cars and automatically adjust one's speed to maintain a safe following distance. And VW's going even further. I was recently invited to a demonstration of its newest generation of research projects. In the parking lot at Candlestick Park, south of San Francisco, I was riding in the back of a fancy Audi following another Audi through two lines of orange cones. As the car in front of us stopped, the lanky German driving our car indicated that he was going to look away from the road and slam on the accelerator. And we did not crash. That's because two cameras mounted near the rear and side view mirrors had detected the movement of the driver's head (meaning his eyes) away from the front of the car and, using software developed at the University of California, San Diego, had told the car's onboard computer to switch into autopilot. As our driver pumped his knee up and down, wildly pressing on the accelerator, the car came to a perfectly smooth stop and waited for our man to take back control of the car. The larger point is that futuristic visions distract us from the ways in which cars are already making decisions for us. Each new generation of vehicles is taking on more and more tasks, proving the vehicles can handle specific situations. By the time Google's cars arrive in your driveway, you'll be acclimated to the idea of an artificial intelligence grabbing the wheel because you'll have handed over control tens of thousands of times. That's not to say that the transition will be smooth or without consequence. The many technical, legal and personal hurdles that autonomous cars face will be worked out in much more limited settings, like the blacktop of the Candlestick parking lot or in the moment when you drift from a lane. This is how the future creeps into the present. While it might seem like your main computing device transformed from a Dell desktop into a smartphone overnight, there were thousands of little steps along the way that lead to the moment when you realized the world has changed beyond recognition. Alexis Madrigal is a senior editor at The Atlantic and a visiting scholar at Berkeley's Center for Science, Technology, Medicine and Society, in addition to being a proud new father.